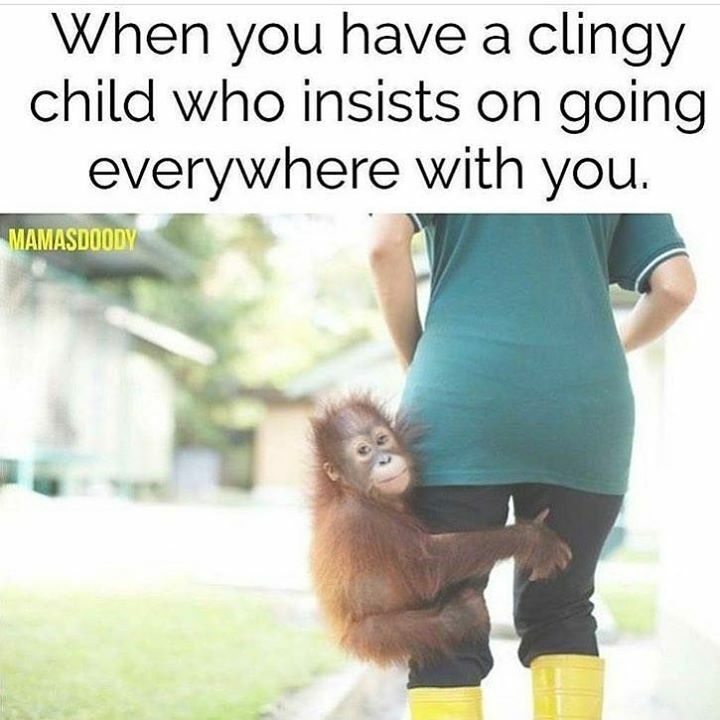 WHEN YOU HAVE A CLINGY CHILD WHO INSISTS ON GOING EVERYWHERE - ProudMummy.com the Web's Community for Mums. WHEN YOU HAVE A CLINGY CHILD WHO INSISTS ON GOING EVERYWHERE WITH YOU. Abi Cliff-Taylor this used to be you when i dropped u at nursery!! Graham Morrissey this is Chloe with you. Adrian remind you of anyone?? Lauryn Taylor - this is you my little orangatang. Gary Hipkin this is Ruby with me! Chris Mckinnon Christopher and ciaran!! Zelda Weller is this Imogen? Karrina Destiny Wright who’s this remind you of? Luke Tex Leibhardt els for sure! If that was my child I'll take it back to the zoo..
who is that little monkey? Elaine Spink this is Elèna!! Poor Gemma had cut my hair while she was attached to me!! Jaimie Young this will be Annie! Leigh Tracey i know a certain 4 year old 😂😂😂, last name Catt. Stuart Cavilla remind u of anyone?? Jenn Wheeler remind you of someone?? I remember it well ! Natasha O'Keeffe it's Maddison !!! Andie Ccm Griffiths this is so Cory! Tim Bentley this is Lucy!! More like u and mum Rabia Patel actually all of u Sajida Patel Saleha Patel!